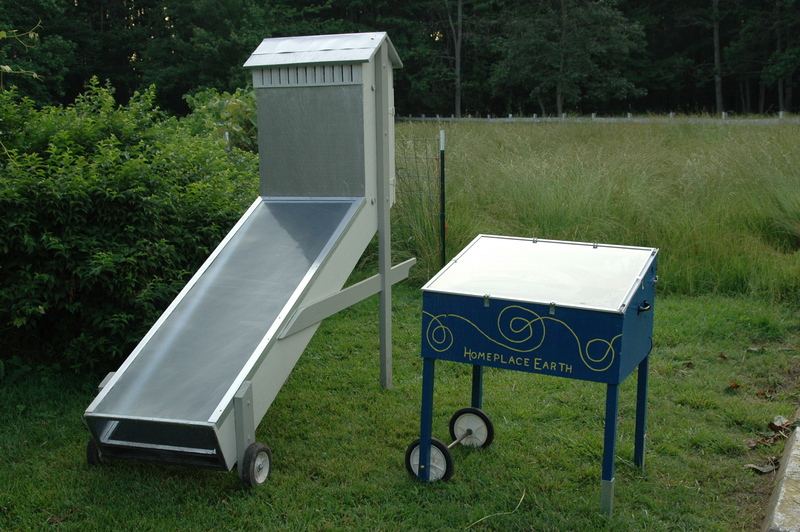 It has been an interesting and fun year with the solar food dryers. As you can see from the picture, I made a summer home for my solar dryers in my garden, laying down pavers which can be easily moved if I change my mind. That area is 44 feet north of a maple tree. It got plenty of sun throughout the summer, but in September the shade started to creep in and I had to move the dryers. When the dryers were in the garden, we didn’t have to worry about mowing around them. Although I had a grill cover for the small one, I usually left it uncovered out in the weather. Now, it is in its winter home in the barn with the grill cover on to keep it clean. The large one will be moved back to the garden, wintering there, ready for next summer. For information about the cost of these dryers and how I made them, take a look at my post on May 31, 2011. 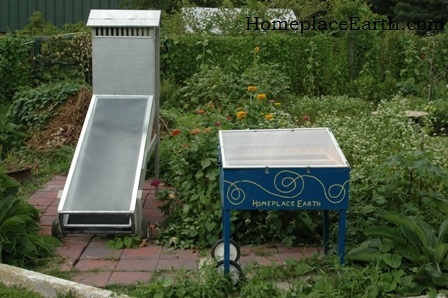 I had the privilege of having the solar food dryer from Acorn Community in Mineral, VA at my place for comparison. As you can see, it is similar to my larger dryer. It has a deeper angle to the collector and the collector box is shallower. Also, the back legs fold up under the collector, which made it easy to transport in my pickup. It seemed to heat up a little quicker in the morning than my large dryer, but other than that, they worked pretty much the same. I assume the steeper angle of the collector caught that early sun. I had it here in early August. I imagine that steeper angle would have made even more of a difference if I was using it in September and October when the sun was lower in the sky. 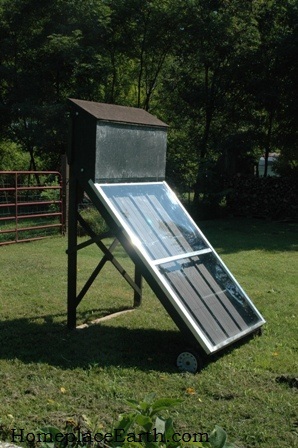 My solar oven has a leg in the back that can be adjusted to raise the oven to more of an angle to catch the sun. I needed to do that during these fall months. 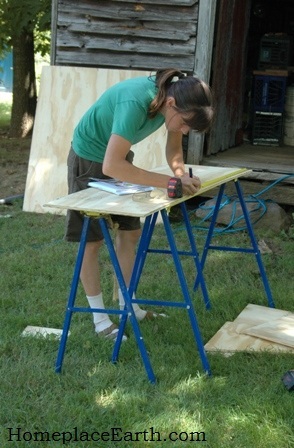 My friends Susan and Molly, and daughter Betsy decided they each wanted to build a dryer this summer. We had a series of work days to accomplish that. If you want to build one, get a friend involved. It’s a lot more fun and it helps to work out the challenges that are sure to pop up. Susan added handles on the sides of hers to make it easier to move around. I like that and would do it if I didn’t occasionally have to load mine in the car to take it somewhere. On my large dryer, I had a piece of plywood across the handles to make a shelf to put the trays on when I was moving them in and out. Those handles of Susan’s made a built-in support to rest the trays on. When not in use, Susan kept her dryer in a covered work area. Molly kept hers on the front porch and brought it out in the yard to use it. There are so many trees where Betsy lives, she put hers in the middle of a field to avoid shading. Before she had it at that location she had some problems with ants crawling up the legs. 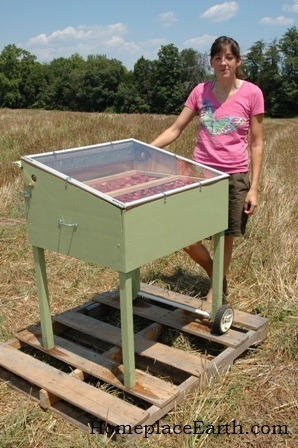 She moved it to the field and put it on a pallet and had no more problem with ants. Just in case, she put Vasoline on the legs to stop the ants. It promptly melted in the summer heat and ran off. Betsy’s dryer stayed out in the weather for the rest of the summer. They finished their dryers in July. Another friend made one, following the directions in The Solar Food Dryer book. His only regret was that he didn’t make it sooner. We all enjoyed success and agreed we are all still learning. July had 5 inches of rain and August had 6 inches, with the accompanying humidity. Most summers are drier. You can never predict, so it is good to have a variety of food preservation methods to use. Of course, the best way to eat your food is straight from the garden all year. So, we have carrots in the ground and row covers over collards and kale now in late November. Garlic and onions from summer harvest are stored, along with sweet potatoes, winter squash, and any Irish potatoes that may be left. I found that I didn’t have much success with green beans in the solar dryer. They are so easy to pressure can and the home-canned beans have been my convenience food for a long time, so I think I’ll stick to canning the beans. I used to can spaghetti sauce using my tomatoes, peppers, basil, parsley, garlic, and onions. I would check through my onions and use the ones that wouldn’t store as well. Now that I dry most of my tomatoes, I have turned to drying those onions that need to be used first. I determine that by pushing my thumb into the center of the onion where the top comes out. The hardest ones, with no give, are set aside to braid and store for winter use. 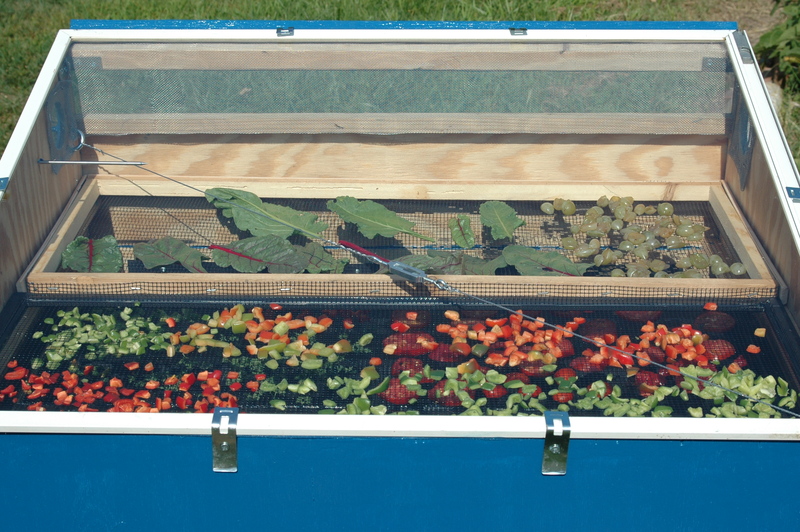 The softest ones are used first in spaghetti sauce and summer cooking, and now, solar drying. They dry beautifully, as do peppers. I chop the peppers before I dry them. Of course, we used fresh peppers from the garden until frost, which was not until Oct. 30 this year. 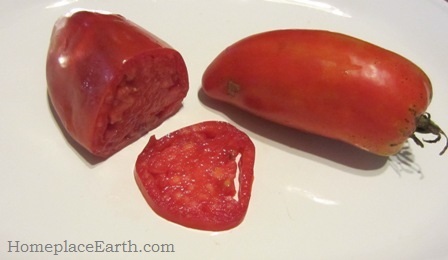 I had some Ruffled Hungarian peppers that were loaded in late October and I chopped up some for the freezer. We still have a few green peppers in the crisper drawer of the fridge from that last harvest. By choice, we only have the freezer space above our refrigerator, so I don’t depend on it for preserving the harvest, but it was nice to put some late peppers in there. The peppers dried through the summer will be used as needed this winter and spring. We bought two bushels of apples from an orchard in late September. I solar dried several loads of them, filled the crisper drawers in the fridge, and left the remaining ones in a basket on the porch. Once the basket was empty, we started using the ones in the fridge, which are half gone now. When those are used, I’ll get into the dried apples. They are great for applesauce or to eat as is. Peaches dried quicker than the pears I tried. I bought the peaches from an orchard. I made raisins from both seedless grapes and ones with seeds. I cut the grapes in half first, so they don’t look like the raisins from the store. I would like to propagate more vines from my seedless variety for raisins so that I don’t have to cut out the seeds like I did with the second variety. That variety with the seeds made great mead with our honey. Each variety has its best uses. Sorry, I planted those two vines years ago and don’t remember the names of the varieties. 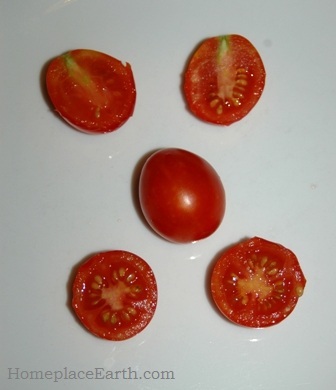 Tomatoes are a given for solar drying, however, since you could have a bumper crop and the climate doesn’t always cooperate, you may want to have alternate plans. I like to can tomato soup, another convenience food, and it doesn’t require long cooking down like spaghetti sauce. Tomato juice is easy and relatively quick to can, not heating the kitchen up too much. It can be used in so many dishes. This year I had a harvest from some of the filbert trees I planted in 2007. I was busy when the harvest was coming in and I didn’t want to lose them on the ground or to the squirrels, so I harvested some of the nut clusters when they were on the tree. Wanting to make sure they were dry, I put them in the dryers. I grew some cotton this year and got it in later than planned. Some of the bolls still hadn’t opened when the frost killed the plants. I put those bolls in the solar dryers and many of them opened. Another time I used them to dry seeds. I was happy to find so many uses for these dryers so late in the season. Having the dryers out in the garden ready to go, I used them as often as I could. Next year, I want to dry more okra, raisins, and onions, among other things. It would be nice to grow some mushrooms for drying. 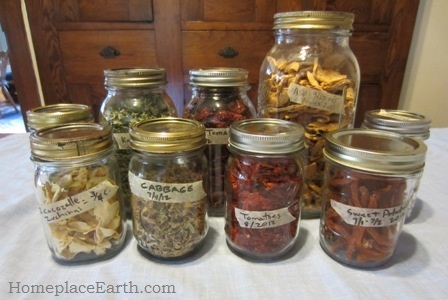 This winter I want to experiment with sauce and soup mixes from my dried supply for quick meals. How did all of you do? Anyone make a solar dryer and use it? Click on any picture and it will open larger in a new window. 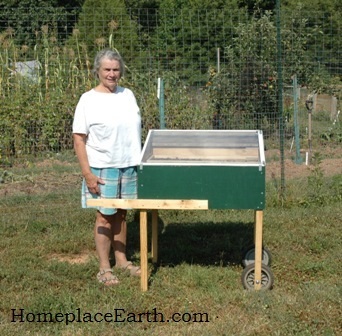 Last August, I built a solar food dryer according to the plans in Eban Fodor’s book, The Solar Food Dryer. It’s the blue one in the picture and I’ll refer to that as the SunWorks (SW) design. I wanted to know if I could actually dehydrate food with the sun in humid Virginia. The answer is Yes! 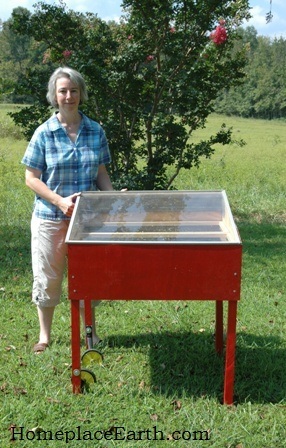 In October, I built a second solar dryer according to plans developed by Appalachian State University (ASU). Those plans were in two articles that I found online from Home Power magazine, issues #57 (Feb/March 1997) and #69 (Feb/March 1999). I’m studying how to lessen my dependence on fossil fuel as far as food is concerned, so solar drying is high on my list to explore. I have an Excaliber food dehydrator that I bought used in 1992. In those days, I was deep into canning our extra produce and learning a new method of food preservation did not fit into my schedule. Besides, when in use the Excaliber pumped hot, humid air into the house and it made noise. Of course, canning produced hot, humid air, so at the time, it was the noise that bothered me the most. I might have used it for tomatoes more, but even with nine trays, it only held about 10 lbs. of tomatoes and it took 24 hours for them to dry completely. I was processing lots of tomatoes in my kitchen for our family of 6 and would run 2-4 times that amount through the canner in an afternoon and be done. I used it periodically for making beef jerky. Times have changed. Now it is usually only two of us at the dinner table and I’m open to some new ideas. I still don’t like noise and I also want to eliminate the hot, humid air of both canning and from the electric dehydrator (not to mention all that fossil fuel). 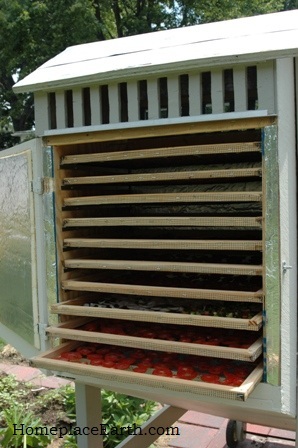 Last summer, I found that the tomatoes in the solar food dryer would be almost dry by the end of the first day. I could leave them in the dryer overnight and they would be finished the second day. That was okay because I didn’t have to listen to a motor or have any disruptions in the house. The only concern was if it would rain the next day. The SW design has an electric option that I built. One day I had tomatoes in it and was gone for the afternoon. That day a storm came up with a brief rain. My tomatoes were fine inside, but I plugged it in that evening to complete the drying, since the next day would be cloudy. I found that I used it so much more because it was just there and the sun was shining. I would look around the garden each day to see what I could put into it. I never did that with the Excaliber. The SW design has only 60% of the drying area as my Excaliber. Since I’m interested in processing a large quantity of food, I built the larger ASU design which has 1.4 times the drying space of the nine tray Excaliber and about 2.25 times the drying capacity of the SW design. Last fall, I was acutely aware of how fast the sun was sinking each day because I had to keep moving the solar dryer so as not to be shaded by the trees on our property whose shadows kept getting longer. When I finished the second dryer by October 21, I was able to dry two batches of apples before I called it quits for the year. The larger dryer stayed out in the weather all winter and the SW dryer spent the winter in the barn. Now that it is time to use it, it is outside all the time with an old grill cover thrown over it during down times. 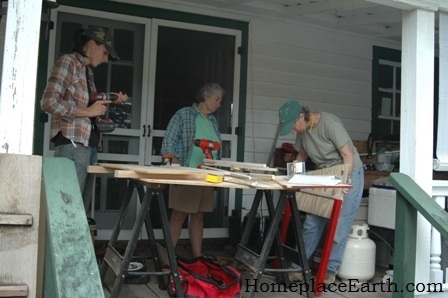 When I built the first dryer, deciding on how to build the screens was a big thing. I sized the dryer to the storm window I had. To have one screen on each level required screens that I thought would be unwieldy getting in and out of the house, so my design called for four screens, two on each level. I ordered food safe screening material from the author’s website at http://www.solarfooddryer.com/ and I’m pleased with it. 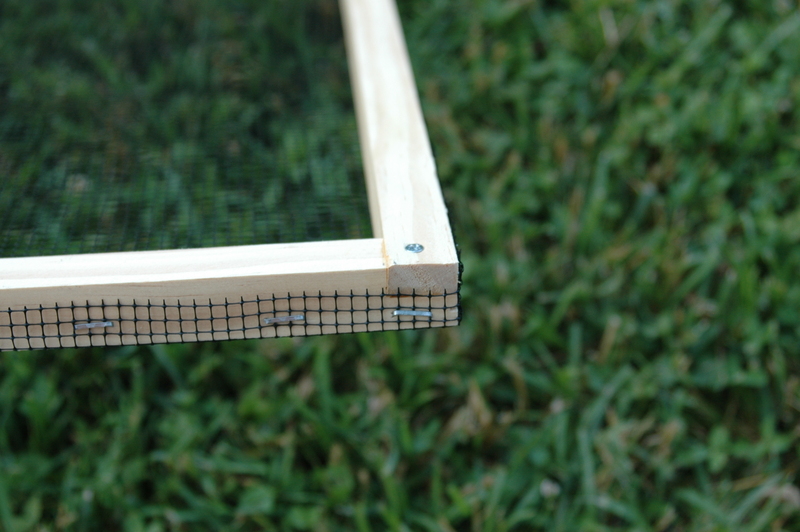 I made one screen frame with some old wood, cut to 1/2″ by 3/4″ and was unhappy with the results. Then I found out how easy it was to make the aluminum frames and made the rest with that. Once I used them my feelings changed. The aluminum frames were HOT to the touch when in use and the wood frame wasn’t. Also, I may be doing something wrong, but I have to keep resetting the plastic spline in places or the screening will pop out of the aluminum frames. 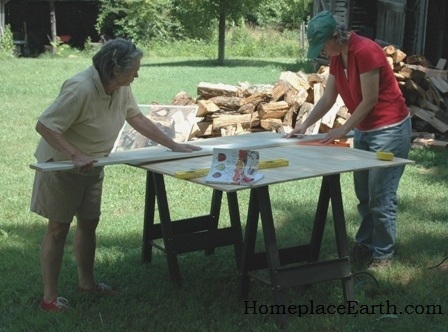 When I made the larger dryer I made nice wooden frames with knot-free wood cut to 3/4″ by 3/4″. The corners are glued lap joints with one screw. These screens are wonderful and actually cheaper than the aluminum ones, but they require more skill to make. They don’t get hot and I can stack them with the food on when carrying them in and out of the house. Having a tablesaw and a terrific husband as my helper is my secret to success. I added 8″ to the length of the legs on the SW dryer and put old lawn mower wheels on one end. To make it level on the other end, I added aluminum corner strips, which hold the legs 2″ off the ground, protecting them from rot. In spite of having some materials already, such as the window, wheels, sheet metal, screening for vents, and aluminum tape, I spent $162 (before tax) on the SW dryer. If I would have made wood framed screens instead of the aluminum ones, I would have saved $18. Hardware adds up quickly and I spent $7 on the two side carrying handles, which I felt were important to the use of the dryer. Hinges also add to the cost, so if you can scrounge the hardware, you will be well ahead. Including the electric option cost me $23, with the porcelain sockets costing $5.49 each. By the way, the ONLY place I could find those fixtures was at an ACE Harware store. I tried other places and other sockets, and those were the only ones that would do. My goal was getting it built and seeing if it worked, not building it with the least money. I’ll be helping a few friends build their dryers in a couple weeks and my experience will help them save some money and time. They’ve already visited the Habitat Restore and found a good deal on some hardware. This dryer is lightweight and easy to move around. The ASU dryer cost me $385 (before tax) to build and I bought everything except the wheels, washers, and caulk. I wanted to do a good job on it, since it would be out in the weather and I wanted it to last a long time. I had to buy twice as much glazing as I needed and cut it lengthwise. The price includes only what I used for this project. I’m sure I’ll have use for the rest sometime. This is a large object, so be sure you have a sunny spot that is large enough before building it. The price per square foot of drying area comes out pretty close to the same for these two dryers, which is about $3 more per square foot over the price of a new nine tray Excaliber that I found online. I noticed that the new Excaliber is listed at 600 watts and my old ED-301 model is 1050 watts. The ad also says that it has 15 sq. ft. of drying area. The 15″x15″ trays in my Excaliber actually only have 14″x14″ of screened drying area, with a 1/2″ plastic frame all around, for a total of 12.25 sq. ft. for the nine trays. My calculations compare the actual screened area on all three dryers. So, I’m ready to go this summer and I want some company. The more of us who are out there doing this and talking about it, the more we can share what we know and build the momentum of learning. I don’t have lots of experience using the solar dryers yet, but I’ve used them enough to know that they work. Last summer, I dried tomatoes, peppers, peaches, apples, summer squash, snap beans, onions, greens, and made raisins from my grapes. Last week, I dried collards twice. They were easy and were done the same afternoon. There was lots of sun during the week, however the clouds moved in this weekend, after I had put some summer squash in. It served as a reminder that we need to be flexible when we are working with things like this. I’ll use the dryers when I can, but if we have a week of rain and produce is coming out of the garden faster than we can use it, I’ll get out the canner. The biggest adjustment to using the dryers is to get the trays filled as early as possible in the morning, to take advantage of the sun. I encourage you to read Fodor’s book, even if you are going with your own design. It’s full of much valuable background information. 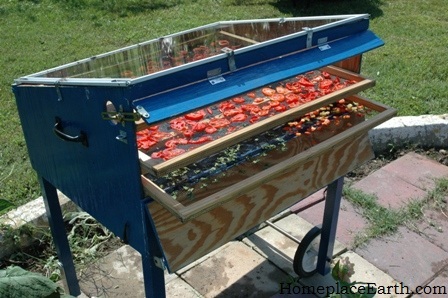 You might not have a good place to use a solar dryer yet, or the skills, time or inclination to build one, but you could obtain an electric one to get started learning about dehydrating food. The important thing is to get started. By the way, people have told me they put their electic dehydrators in a spare room so they didn’t have to listen to them. On September 17, I’ll be giving a presentation on Low Energy Food Preservation at the Heritage Harvest Festival at Monticello. Come and hear about my summer with the solar dryers. Sandor Katz of Wild Fermentation fame will also be there. My next post on June 14 will be about growing grains in your garden, so stay tuned.